Vienne woke with a low-grade fever and was acting mildly lethargic, as most kids do when they have a fever. I took note of the fever and decided that it would be a stay-home, cuddle on the couch, and watch movies day. I have always been taught to not over-react to mild fevers, as they are a good sign of the body's way of fighting infections. Vienne had always been a ridiculously healthy child, so I often took mild illnesses in stride, knowing that her immune system was strong and would help the fight. I figured that a bath would help her to feel a bit better. I remember that I asked Vienne if she was interested in a bath while I was changing Ivy's diaper (Vienne's baby sister, who was 8 months old at the time) and getting her ready for her morning nap. Vienne was sitting nearby and said that she did not want to take a bath and complained of a tummy ache. Tummy aches usually meant that she had to go potty, so I suggested that she try. She sat on the potty and started to cry because she couldn't go. The crying was a bit odd but I told her it was ok, comforted her, lay her in her bed with a movie on the iPad, and encouraged her to take some bites of her eggs while she waited for me to put Ivy down for a nap. When I was done with Ivy and with getting myself dressed, I came to check on Vienne. She had eaten some of her eggs and said her tummy was feeling better. I realized that she must've just been hungry. I decided to ask her, for the second time, if she would like to take a bath, now. This time she was interested. So, I ran her a bath to about 6" or less and she got in. I remember that I had asked her if I could wash her hair then or if she wanted to wait a bit and play. She chose to wait. If I had stayed to wash her hair, it might've been an opportunity to allow me to stay upstairs and maybe even thwart the outcome of this horrible morning. But, instead of staying upstairs to change her sheets, which I knew needed to get done, I hadn't eaten yet and was just so hungry and really needed to get myself some quick breakfast. I decided to head downstairs...which was actually very rare for me to do. That was the last time I spoke to my Baby Girl, the last time I saw her alive. I went downstairs and made my smoothie. The kitchen was right below her bathroom, and since I heard her gently moving around in the tub, I decided to catch a few quick words from my Bible. Ironic, don't you think? I haven't touched my Bible until just recently, but discovered that I was reading Psalm 43. I headed back upstairs to bathe her...I had been downstairs for about 15 minutes only. When I came to the top of the stairs and looked into the bathroom, I didn't see her head sitting up above the bathtub. For a split second I thought that maybe she was practicing her swim lesson back float, but my gut told me otherwise. In three quick strides, I walked into her bathroom to discover the horror of my Vienne lying on her back, under the water, with her head turned to the side, unconscious and completely gray in color. Looking back, I know I must've screamed something and dropped my smoothie (as there was evidence of that all over the floor, as depicted in the report), but all that I remember was immediately swooping her limp body up out of the water and laying her on the carpet outside of the bathroom. I pulled my phone from my pocket and with violently shaking hands, I dialed 911. Once on the phone with them, I had the phone cradled on my shoulder while trying to administer CPR and my cheek hung up on them. I had to redial. Trembling. Shaking. Screaming. Panicking. She was dead. I already knew it. You just know these things. But, I kept trying. The 911 dispatcher was a complete idiot. Thank God I knew CPR already, but obviously, it did no good. But, all I remember from the call was him saying something like "let me get the manual on CPR" while I screamed at him and gave up on his help. Thankfully, help arrived in literally less than 5 minutes. I had to leave her side to run down the stairs and let them in - what a wretched thing to have to do...leaving your dying baby's side to get the door. I was in shock and hyperventilating and talking nonsense...I can't even remember. But, I know that they ushered me into her bedroom and closed the door and kept me in there with two of their paramedics. They soon had a chaplain arrive and sit by my side. I was clueless. I should've known why he was there. I remember one guy had my phone and was calling Mark for me and I had to tell someone else to not let me forget my baby in the other room who was sleeping. I kept nonsensically saying that I killed Vienne. And, then all I did was sit on the floor of Vienne's room, clutching her Dolly, rocking back and forth, and saying over and over and over again that she couldn't die and that she was just the most amazing little girl ever...she just couldn't die. And, then the look. I will never forget the look on one of the paramedic's faces. He couldn't even talk to me or look me in the eye. His eyes were full of sorrow and pain and knowing. He knew, already, too that it was too late. He had to stay in the room with me but he couldn't even barely contain himself. I just pointed at his face and yelled at him because I knew what his eyes were saying. 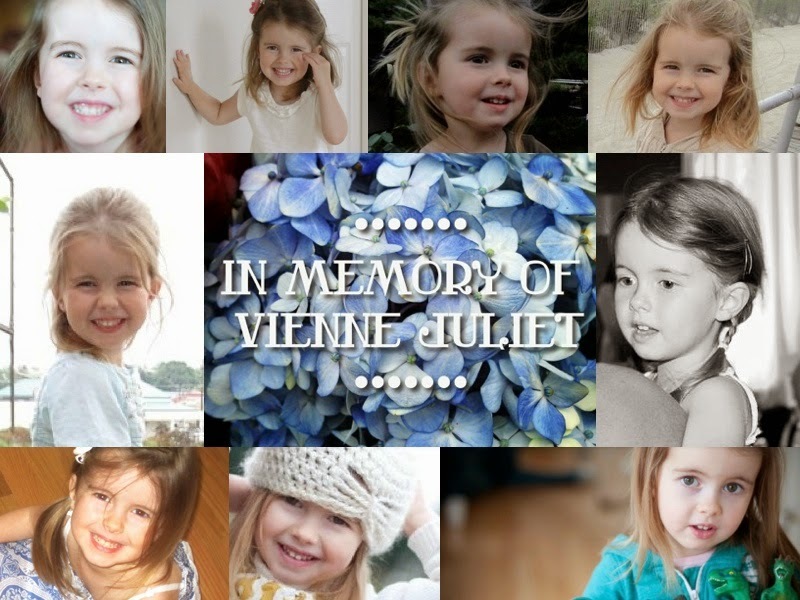 We later learned that the entire team of paramedics who worked on Vienne were so emotionally affected that they couldn't continue their work after her, that day, and they all went home. They took her by ambulance and I didn't even know they had left. Mark showed up while they were wheeling her away. And, I just kept yelling that I had killed our Baby. I just kept irrationally screaming it, in anguish. Mark and I clung to each other and wailed. Eventually, one of the paramedics took Mark from the room and I overheard him telling Mark something about them having gotten a slight heartbeat back. There was a sliver of hope. And, we started to pray more. We prayed HARD and enlisted as many people to pray as we quickly could. The Chaplain contacted his prayer chain to enlist as many as possible. Then the Chaplain drove us, with Ivy, to the hospital and we all prayed aloud in his car the entire way. When we arrived, they ushered us into the private room for families that are awaiting bad news. I didn't know this at the time...but now I see, looking back. They had a grief counselor in there waiting for us. I hated her. I just remember nursing Ivy and crying, and just being in confused disoriented shock. Eventually, the head doctor came in and delivered the final news. My worst ever nightmare had officially just become my reality. They asked us if we wanted to see her. I couldn't. I just couldn't. But, Mark had to and so he did. And, he held her hand as they stopped the resuscitation. Sometimes I regret not saying goodbye...but, in that moment, I had seen enough of her dead and I was in major traumatic shock...still am. We weren't allowed to go home yet. An investigator had to come in and ask us questions. Then, we had to wait for the coroner to come and look her over and then ask us more questions. Up until this point, I had really believed that I had killed her...or allowed her to die by my negligence. I wasn't thinking clearly...I wasn't remembering that she was 4 1/2 and it was ok to let her bathe for a short time alone in shallow water (even our DHS caseworker told us he lets his 4 yr old stay in the bath alone)...that she had taken water safety and swim lessons and knew how to hold her breath...or that, despite that, she NEVER put her head under the water EVER, anyway. I was just thinking that, because I wasn't there, I let her die. But, when the coroner came in, he explained that it didn't make sense for it to be a drowning. Why would a 4 yr. old just simply drown in such shallow water? Why didn't I hear anything, while I was right below her? He emphatically told me that I would've heard something...that she would've shown signs of a struggle. But, there was none of that. I had never stopped to think "wait, something doesn't make sense about this. "...I just thought that it definitely must be my fault. And, no matter what, I still will to some degree, for the rest of my life. But, over the next few days, we learned from her autopsy that there definitely were not any signs of a struggle, or a drowning...no bruises, no contusions. There wasn't water outside of the tub from splashing. No noises. We even later learned that there wasn't enough water in her lungs to have drowned. Investigators went to our house and poured over every detail...they just couldn't make any sense of how she ended up under the water. When I found her, it literally looked as if she peacefully just lay down under the water and died. Something was awry. And, we had to wait for toxicology lab results to further give insight. For 2 months, we all knew she hadn't drowned but were so confused as to how she could die. We speculated that it was as if God had just stopped her heart and she gently slipped beneath the water. Then, the results came. And, our speculations were starting to sound more like truth. It was discovered that Vienne had quickly developed what is called 'ventricular myocarditis'. Myocarditis is an infection in the heart. They guessed that it was from a viral infection. What is assumed that happened is that Vienne caught a virus (any number of viruses or bacteria can cause this) and this virus just so happened to go to her heart (we all know viruses don't always go to the heart...this was just the course that this one decided to take, this time). The virus caused an infection, which caused the right side of her heart to swell just a bit...but enough to cut off blood flow and cause her heart to stop. Instantly. Without ANY symptoms but a sudden slight fever. When you read about myocarditis, it is explained that it is one of the most undiagnosed, misunderstood, unknown, quiet diseases. It can happen to anyone. It happens quickly and with little to no symptoms. Any symptoms documented on it, are just those similar to a common cold or flu. Doctors are rarely able to diagnose it because it looks just like a cold or flu and then their patients often die within hours. I have read several accounts of this. It is devastating and maddening. It was only a coincidence that she was in the tub. I guess it would've happened if she was still in bed. I still think, though, that maybe there might've been a chance to save her, if she wasn't in the water. But, I am told that that is most unlikely. I still blame myself, though...and I blame God. How can I not? Vienne died from myocarditis - an infection in her heart that caused her heart to stop, suddenly and unexpectedly, without symptoms or signs. She did not drown. We got 4 years, 4 months, and 6 incredible days with the most amazing little girl we had ever met. I do not regret one moment with her, as her mother. I miss her more than you could ever understand. 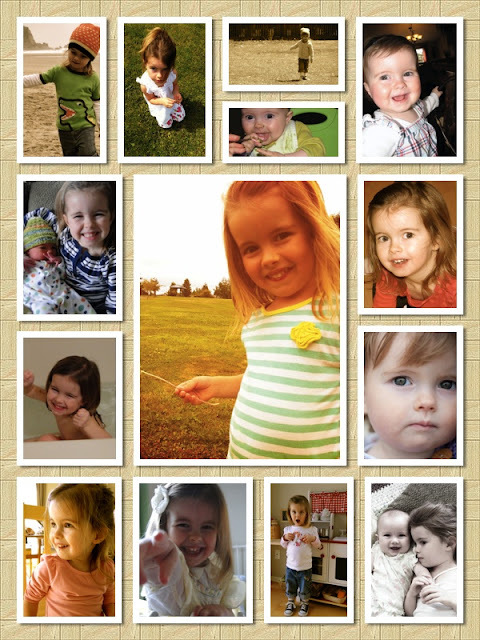 If you are new to my blog for Vienne, please stay a while and get to know my beloved beautiful little Girl. You will fall in love, too. I promise. oh sweet face!! Totally in love!! I just stumbled upon your blog tonight and it is now nearly 4am and I have just finished reading through your posts. I just could not stop reading and could not put the computer down to go to bed until I was done. My heart aches for you and your precious family. Such a beautiful angel and I pray that you see so much of her in little Ivy over the years to come. I am looking forward to reading more of your memories with your sweet girl as you post them. Hi Jenny, I wrote to you earlier about my Aunt and the loss of her daughter. Reading this post today as well as all the others you have written, brings me only one conclusion. Your beautiful, sweet and most darling Vienne had everything in life but the gift of time. Vienne was so gentle and loving and it shows in her photographs and videos. My heart goes out to you everyday. I pray for Mark and you to find some tiny bit of peace. The dreadful burden you now carry is so sad and lonely. I so enjoy your posts and getting to know such a beautiful family. Again I am so sorry for you. One of my most favoritte videos of Vienne is the one she is wearing a blue crochet hat, eating as you interview her. Her big beautiful eyes and smile melts my heart. Wow, I can't believe you stayed up until 4am to read my entire blog. I should sit down and try to accomplish that, at some point. Thank you for your prayers and sweet words. It all means so much. Yes, I remember you comment earlier about your Aunt. Thank you for writing to me, again. Thank you for your prayers - it is huge to me. I love that interview video of her too. Her facial expressions just melted me...always. Love you Jenny. Thanks for your openness and honesty. Jenny, thank you for sharing this and other stories about beautiful Vienne. Through you she keeps affecting our lives and will do so forever. Her life was short but the number of people she has touched and the intensity of love she has spread is beyond what anyone can expect in a lifetime. My heart goes out to you and your family. Sanna ~ I am so in awe when I hear how Vienne has been touching so many lives since her death. It makes me speechless and eager to hear more. How? How does one sweet special little girl from a small humble normal family suddenly affect so many?? I am just in awe and so humbled. I love you so much, Jenny. You are such an outstanding mother! I'd be delighted if I could immolate more of your attributes with my own children. I love you, my sister, my friend. We don't know each other. I am a friend of a friend and found your blog as a result of FB posts. I read your first few blogs then. I'm glad you now know what happened, and I hope it will give you peace as time passes. My heart breaks for your great loss. Prayers for you, as you learn to live here, while she walks in Heaven. Someday, what a great reunion awaits you there! Thank you so much, Lynne. It means the world to me to hear the support I have out there. Oh my goodness. I'm so sorry that you are having to walk this path. It's so hard. I don't wish it on anyone. My heart just breaks for you. I can't begin to tell you how much I was blessed by your comments on my blog. It was just what I needed and I am so appreciative that you took the time to write me that note. Trisha ~ thank you for leaving a comment back. I'm glad mine was able to bring some momentary comfort. I am sorry that we both have to walk this horrific path. I knew this post was sitting here waiting for me to read, I've been avoiding it but also knew it was something I needed to do. I have my own wretched memories of that day which I relive practically everyday. And I know that yours are so much worse. It is the worst day of my life, of all our lives. It hurts indescribably to know the pain you go through everyday and the horror of it all. I love you so much...so many tears for missing Vienne and for the hurt you now have. I love you. Such a pretty little girl. So much heartache. I think of you across the ocean. thank you, so much, Valie. This means so much. Jodi ~ Thank you for reading and taking the time to share your heart. It means so much to me. Thank you for your tears and prayers, as well. They are needed. Anne ~ thank you so much for taking the time to read and write to me. This means so very much to me. Your encouragement and warm thoughts help to strengthen my weary heart. Thank you so much for this and for inviting me into the Myo group. I look forward to gaining a new level of support from those who are walking this horrible journey, as well. A friend of mine shared your story on facebook. I was immediately drawn to this post. I, too, have gone through "mom guilt" in a brain injury that happened to my son. ( http://judahsjourney.com/2014/03/14/mistakes-regrets-and-finding-forgiveness/ )Your vulnerability in sharing your story is refreshing and powerful. Thank you for opening your heart and sharing the beauty and joy of Vienne's life. You are impacting many! thank you for this sweet note and for taking the time to read. It means so much when people reach out. I will venture over to your blog when I get a chance and get to know your story a bit, as well. I also like many others stumbled upon your blog. I recently lost my cousin who was 23 years old and perfectly healthy to myocarditis. Thank you for helping to bring awareness through the pain that you are going through. I am so sorry! I just came back onto my blog today (a day after Vienne's 10th birthday) and noticed some old comments that I hadn't seen before. I haven't updated my blog in a few years and the comments don't come into my main inbox anymore. I need to be more intentional about checking. But, even though it's over a year later, I just wanted to thank you for reading and saying something. I am sorry your family and the loss of your cousin. I hate hearing about another myocarditis loss. The sudden unexpected losses like that are just so maddening. Thank you again and I hope you are well. I can’t stop crying. My daughter who is almost four and I walked to the park off of Barrows and saw so many of your beautiful notes that were left. Genevieve found one of the dino’s And we walked to her bench and we both cried and wished her peace and love for your family. Genevieve said she wished she could meet her and left one of the very last Dino on her special bench. Thank you so much for making the effort to look Vienne up and write us a note. This is a sweet gift to us - for someone new to know her name and think of her. It's been 6 years now since she has been gone, but these little notes from new people always mean so so much.